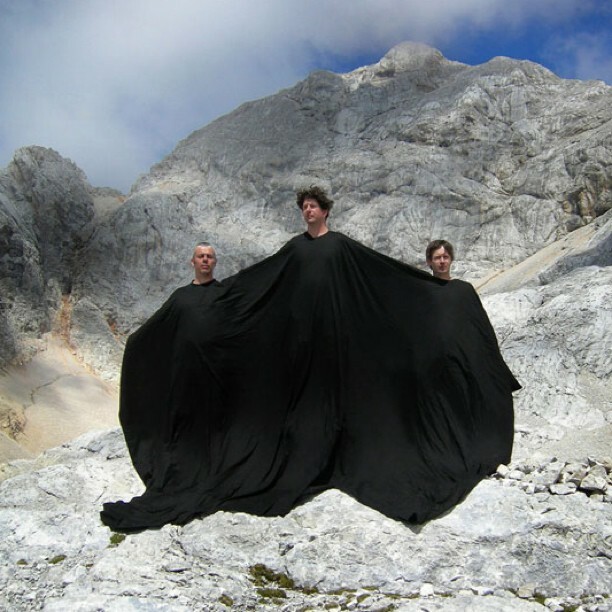 janezjansa 08:44 07.05.2012	This entry was posted in Crowdfunding. Bookmark the permalink. You’ll get ‘Special Thanks’ credit on the film, on the film’s website and social media. 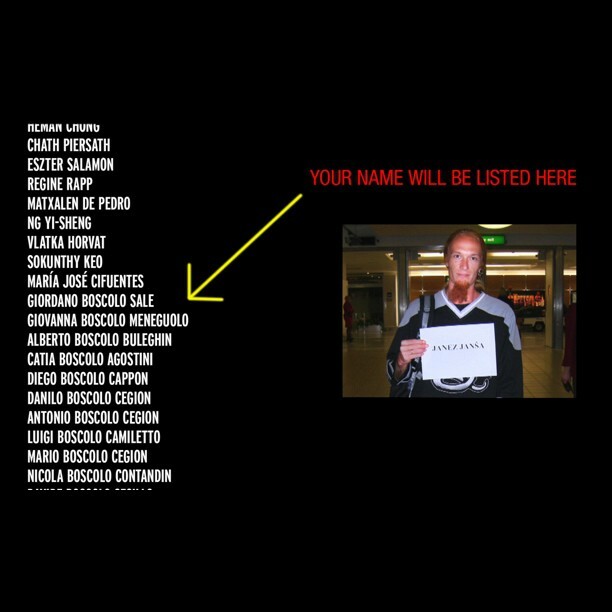 You’ll be able to download the file of the documentary »My name is Janez Janša« and be among the first to see it + You’ll get ‘Special Thanks’ credit on the film, on the film’s website and social media. You’ll get a copy of the limited edition DVD of »My name is Janez Janša« autographed by the 3 artists Janez Janšas + ‘Special Thanks’ credit on the film, on the film’s website and social media. 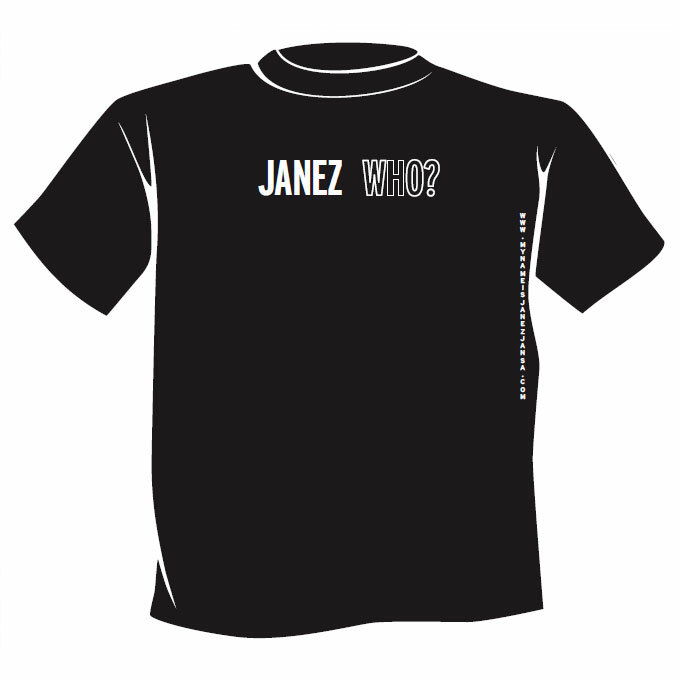 You’ll get one of 4 exclusive T-shirts of your choice + a copy of the limited edition DVD of »My name is Janez Janša« autographed by the 3 artists Janez Janšas + ‘Special Thanks’ credit on the film, on the film’s website and social media. 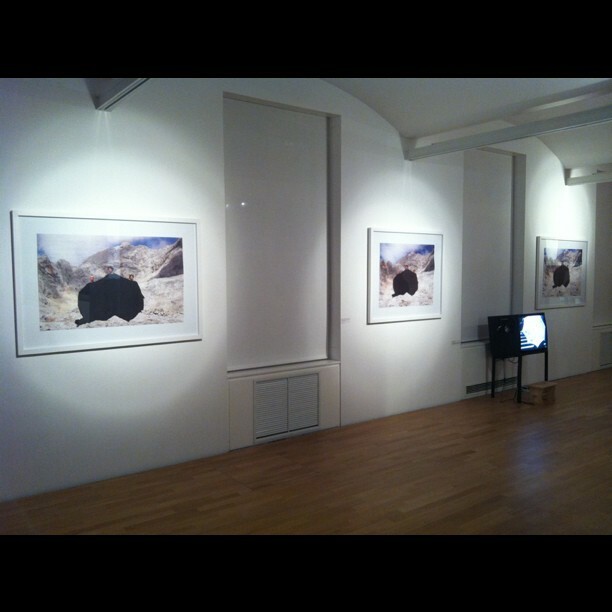 You’ll get a 20×30 cm photo print of the artistic action »Mt. Triglav on Mt. Triglav« as seen in the film, certified and signed by 3 authors (non framed) + one of 4 exclusive T-shirts of your choice + a copy of the limited edition DVD of »My name is Janez Janša« autographed by the 3 artists Janez Janšas + ‘Special Thanks’ credit on the film, on the film’s website and social media. 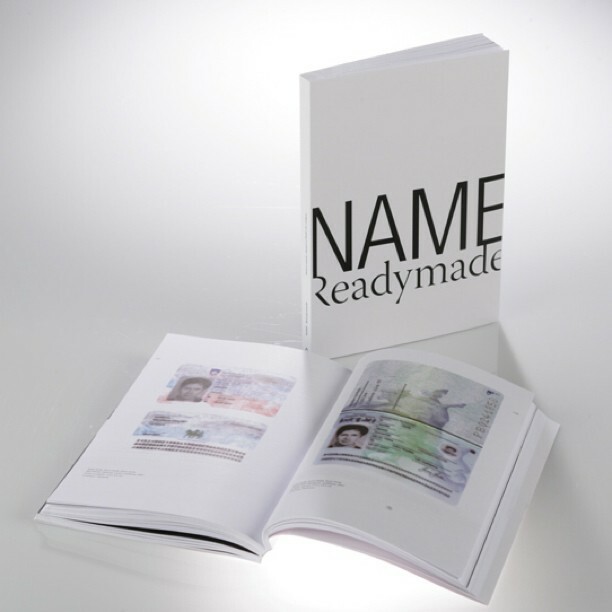 You’ll get one of the following books of your choice, with personal dedication and autographs of the 3 artists Janez Janšas: »Janez Janša Biografija« (SLO language) as seen in the film or »Name Readymade« (ENG language) with essays from participants of the film or »Signature« (SLO & ENG) from the 3 artists Janez Janšas + A copy of the »Letter to the Prime Minister Janez Janša« as seen in the film, signed by the 3 artists Janez Janšas (SLO and ENG version available) + A 20×30 cm photo print of the artistic action »Mt. Triglav on Mt. Triglav« as seen in the film, certified and signed by 3 authors (non framed) + one of 4 exclusive T-shirts of your choice + A copy of the limited edition DVD of »My name is Janez Janša« autographed by the 3 artists Janez Janšas + ‘Special Thanks’ credit on the film, on the film’s website and social media. 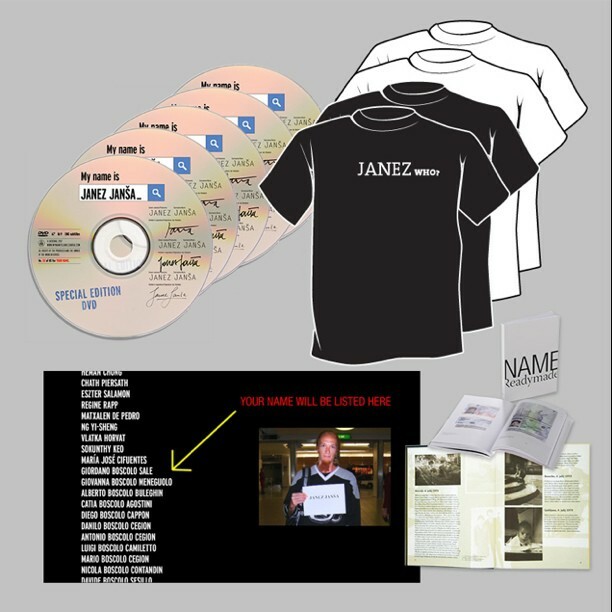 You’ll get 5 copies of the limited edition DVD of »My name is Janez Janša« autographed by the 3 artists Janez Janšas + All 4 exclusive T-shirts + All 3 books with personal dedication and autographed by the 3 artists Janez Janšas: »Janez Janša Biografija« (SLO language) as seen on the film, and »Name Readymade« (ENG language) with essays from participants of the film, and »Signature« (SLO & ENG) from the 3 artists Janez Janšas + A copy of the »Letter to the Prime Minister Janez Janša« as seen in the film, signed by the 3 artists Janez Janšas (SLO and ENG version available) + ‘Special Thanks’ credit on the film, on the film’s website and social media. You’ll become an exclusive owner of the triptych artwork »Mt. Triglav on Mt. Triglav« certified and signed by 3 authors (edition of 3 – One is part of the permanent collection of the Museum for Contemporary Art Metelkova) + You’ll get ‘Associate Producer’ Credit on the film, on the film’s website and social media + 5 copies of the limited edition DVD of »My name is Janez Janša« autographed by the 3 artists Janez Janšas + All 4 exclusive T-shirts + All 3 books with personal dedication and autographed by the 3 artists Janez Janšas: »Janez Janša Biografija« (SLO language) as seen on the film, and »Name Readymade« (ENG language) with essays from participants of the film, and »Signature« (SLO & ENG) from the 3 artists Janez Janšas + A copy of the »Letter to the Prime Minister Janez Janša« as seen in the film, signed by the 3 artists Janez Janšas (SLO and ENG version available).